France has traditionally been a pragmatic geopolitical player in the Middle East and North Africa (MENA). In spite of some changes in nuance, neither regional shifts brought about by the ‘Arab spring’ nor Francois Hollande’s presidency have changed the essentials of the so-called politique arabe de la France: retain friendly and stable relations with all MENA governments (except Syria currently) in pursuit of France’s three main interests: regional stability, energy security and arms exports. In recent years, France has prioritised key bilateral alliances over efforts to strengthen multilateral schemes, including via the European Union (EU). While his predecessor Nicolas Sarkozy hid this reality behind a multilateral approach (the Union for the Mediterranean), Hollande displays his emphasis on a few regional allies more openly. Under Hollande, France has also further consolidated the geo-economic aspects of its MENA policy on commercial interests. France’s total trade each year with the Arab world is now worth €57 billion. 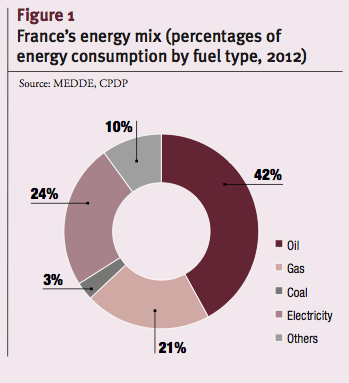 In the area of energy, in spite of efforts to diversify, in general the French economy remains heavily dependent on oil which accounts for 42 per cent of its energy consumption, and gas covers one-fifth (see Figure 1). 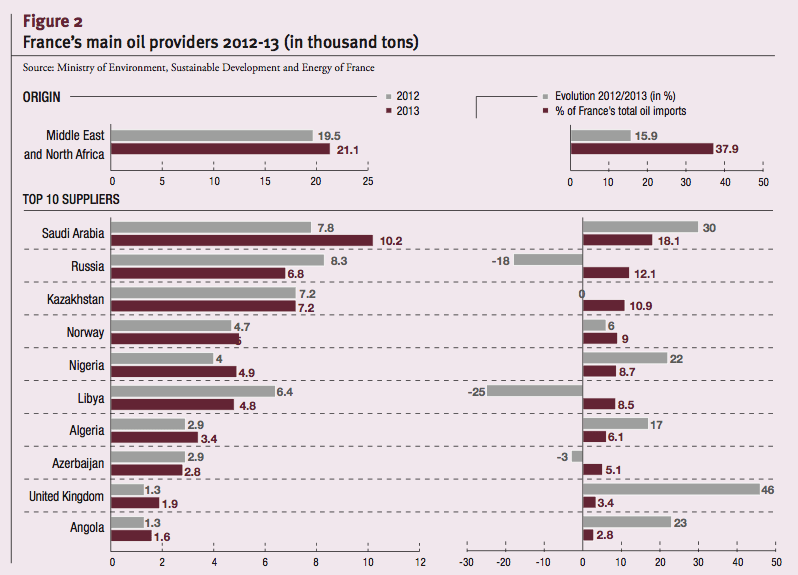 In 2013, France imported 37.6 per cent of its crude oil from the MENA, its first oil supplier. The main oil suppliers to France within the region were Saudi Arabia (18.1 per cent), Libya (8.5 per cent), Algeria (6.1 per cent) and Iraq (2.2 per cent). Between 2012 and 2013, France’s oil supply from the Middle East witnessed a shift away from Libya, to the benefit of more stable suppliers such as Saudi Arabia and Algeria (see Figure 2). 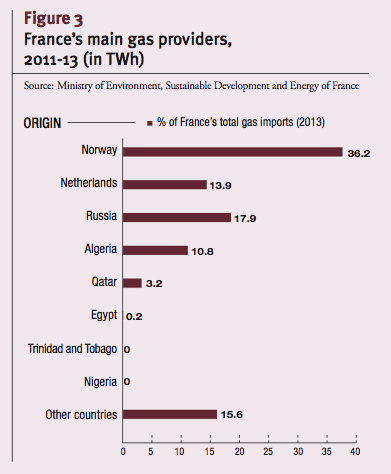 In the area of natural gas, France’s dependency on the MENA region is less important, 14 per cent in total. In 2013, 10.8 per cent of France’s imports came from Algeria, 3.2 per cent from Qatar and 0.2 per cent from Egypt (see Figure 3). France is aware of the need to diversify its energy mix and reduce dependency on volatile import regions such as the Middle East. However, although it has recently decreased the Middle East’s share of its energy imports, dependency on Arab and particularly Gulf providers still makes France vulnerable to the region’s highly volatile security outlook. Disruptions of energy flows due to tensions with Iran or the fragile situations in Iraq and Libya explain Hollande’s desire to strengthen relations with Saudi Arabia – the world’s biggest crude producer that currently remains more stable than most other MENA countries. France was the third-largest external investor in the Middle East during the period 2003-2012, accounting for 6.2 per cent of total foreign direct investment (FDI) to the region. During this period, France invested a total of $58 billion: $24.6 billion in resources and oil manufacturing; $8 billion in non-oil manufacturing; $12.6 billion in commercial services; and $13 billion in non- tradables. The largest investments were made in Saudi Arabia ($16 billion), Morocco ($10 billion), Qatar ($7 billion), Algeria ($6 billion) and the United Arab Emirates (UAE – $5 billion). France also has three companies that rate amongst the top 50 multinational corporations that operate in the MENA: Total (No. 5), GDF Suez (No. 19) and Accor (No. 37). Defence companies, such as MBDA and Thales, also contribute significantly to France’s trade with the region. Despite considerable variations on specific years, France is one of the biggest arms exporters to the Middle East. Between 2005 and 2010, for example, it came third after the United States (US) and Russia (see Figure 4). According to French defence ministry figures, in 2013 some 48 per cent of France’s defence export orders went to MENA countries, with Saudi Arabia accounting for 27.5 per cent of total orders (€1.9 billion out of €6.9 billion), followed by Morocco (€584.9 million), the UAE (€335 million), Qatar (€124.9 million), Oman (€104.1 million) and Algeria (€96.6 million) (See Figure 5). 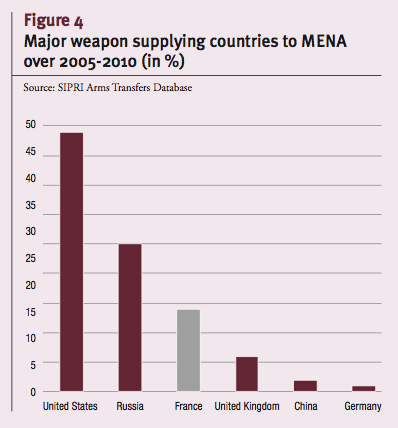 During the period 2003-2012, France’s main defence clients in the MENA were Saudi Arabia (No. 1), the UAE (France’s second MENA client and fourth overall after India and Brazil), Morocco (No. 9), Oman (No. 15) and Qatar (No. 20). Nuclear agreements – with no official amounts released publicly – have also been signed with each of Algeria, Egypt, Jordan, Libya, Morocco, Saudi Arabia, Tunisia and the UAE. In 2009, French President Nicolas Sarkozy inaugurated a military base (called ‘Peace Camp’) in the UAE. While it reflects France’s commitment to help defend Arab Gulf countries against an Iranian attack or any attempt from Tehran to disrupt commercial traffic in the Persian Gulf, the means are limited (6 Rafale aircrafts and 750 soldiers as of September 2014, costing nearly €75 million each year according to a report published by the French Senate in 2011). The base is now used for France’s participation in the US-led anti-Islamic State in Iraq and the Levant (ISIL) coalition in Iraq. In addition, it serves as a symbol of France’s commitment to the security of the region. France’s military footprint in the region has grown significantly, mainly because France has put the fight against jihadism at the centre of its national security strategy, though sometimes with contradictory results for its MENA strategy. France’s decision to militarily intervene in Mali (operation Serval), to hamper rampant Islamist fighters (National Movement for the Liberation of Azawad, Ansar al-Din, Al-Qaeda in the Islamic Maghreb) at Bamako’s request, is the most forceful recent example of France’s anti-jihadism focus. At the same time, however, in Syria, France has strongly supported anti-Assad fighters of the Free Syrian Army, which has included not only ‘secular’ rebels, but also Islamists and jihadist fighters. France also succeeded in 2013 in convincing other EU member states to lift an arms embargo to supply ‘moderate’ rebel groups. Meanwhile, however, the opposition has further fragmented, creating the conditions for the rise of extremist groups (Jabhat al-Nosra, Jaysh al- Islam) and the emergence of ISIL. The growing challenge of ISIL in Iraq and Syria worries France, which has joined the international coalition bombing their positions in Iraq. France played a key role in the operation that led to the fall of Gaddafi. However, Paris has not been able to establish itself as a privileged partner with Libya. It did not anticipate accurately the conse- quences of the fall of Gaddafi in terms of further instability and state failure. France’s approach to the country has since focused mainly on security issues such as participating in the Tunisia-based EU Border Assistance Mission (EUBAM) to Lib- ya and very limited training of local forces – only 122 Libyan military officers and 75 paramilitaries had been trained as of December 2013. French companies and official representatives had to leave Libya because of the violence, and France privately worries that it may have to consider another mil- itary intervention in Libya. In a veiled reference to these concerns, French Defence Minister Jean-Yves Le Drian has said that ‘acting’ in Libya is needed with the help of the inter- national community. France also fears jihadist attacks on its own soil. For example, the French anti-terrorist operation Barkhane across the Sahel has been deployed partly because of growing concerns about the deteriorating situation in Libya. Furthermore, France seems intent on a rapprochement with Algeria because of their common terrorism concerns. Because of shifting regional dynamics, Hollande has changed some aspects of France’s engagement with Arab partners. In the Gulf, France clearly prioritises Saudi Arabia and the UAE while de-emphasising relations with Qatar – Saudi Arabia’s regional challenger. These decisions were partly influenced by the president’s desire to distance himself from his predecessor’s policies, which favoured Qatar. Plus, France and Saudi Arabia share common points of view on two important files: their will to topple the Syrian regime and their opposition to any step that would strengthen Iran’s regional influence. This rapprochement may have helped motivate a pending Saudi-funded $2.2 billion French-Lebanese arms deal to beef up the Lebanese army’s capabilities to combat terrorism. In the Maghreb, Hollande’s strategic choice of improving relations with Algeria, while not received with enthusiasm in Rabat which remains cold with its neighbour, has not led to a deterioration of French-Moroccan relations. France is keen on maintaining stability in Algeria, especially because of the possible impact of instability spreading from neighbouring Libya and Mali. Paris believes that Algiers is an important partner due to its contribution to the fight against terrorism in the Maghreb and the Sahel. France sees an incompatibility between its interests and those of Russia and Iran. France maintained good relations with Russia before the 2014 events in Ukraine, but opposed Russian support to the Syrian regime. Furthermore, as the second-biggest arms supplier to the region, Moscow is one of France’s greatest arms export competitors. For example, Algeria buys 91 per cent of its arms from Russia and only 3 per cent from France. Egypt completed a $2 billion Saudi and Emirati-funded arms deal with Russia in February 2014, and Iraq a $4.3 billion deal in 2013. Moscow also sells weapons to Iran, Libya, Saudi Arabia and Syria. In relation to Iran, France is uncomfortable with Tehran’s support to Bashar al-Assad in Syria, and with the influence it has in Iraq. Furthermore, it thinks that Tehran’s defence capacities already make it able to threaten both EU and NATO countries and the MENA region through its development of longer-range ballistic missiles. France worries that Iran’s access to military nuclear capacities would encourage regional nuclear proliferation. on the Iranian nuclear file. The retention of Laurent Fabius as foreign minister, who has a reputation for being an Atlanticist, following the French government reshuffle in summer 2014, is also an indication of France’s desire for more coordination with the US, including via NATO. Between 2007 and 2011, France’s bilateral Official Development Assistance (ODA) to the Middle East fell from US$1 billion (13 per cent of France’s total bilateral aid budget) to US$210 million (2.31 per cent of the total). By contrast, France’s aid to North Africa increased from US$1.066 billion (13.78 per cent of the total) to US$1.3 billion (13.25 per cent) over the same period. In September 2011, France announced it would allocate €2.7 billion over the period 2011-2013 to support Egypt, Jordan, Morocco and Tunisia. In May 2011, under the French presidency, the G8 responded to the ‘Arab spring’ by launching the Deauville partnership, aimed at backing democratic transitions in the Middle East in four key priority areas: stabilisation, job creation, improving economic governance and cross-border integration. A MENA Transition Fund has been set up in this context to complement other bilateral and multilateral initiatives in support of governance and economic reforms. With a view to coming years, a significant decrease of France’s aid contributions to the MENA region can be anticipated. According to the French law of finance for 2015, France’s public development aid will shrink by 2.5 per cent in 2015, and will be reduced by up to 10 per cent over the next three years. Despite having provided a considerable amount of development aid to the region, France’s commitment to reform in the Middle East and North Africa is very uneven. In official rhetoric, France puts democracy and human rights at the centre of its activities in the Middle East. But in practice, France only publicly mentions human rights violations in the case of countries where this serves, or does not harm, specific French interests (Syria, Egypt). It remains particularly uncritical in countries where strong economic interests prevail (Morocco, Algeria, Gulf countries). France’s selling of weapons to authoritarian regimes in the MENA region is indirectly impacting democratic governance and human rights-related prospects. France’s main arms import clients (Algeria, Morocco, Oman, Saudi Arabia and the UAE) are the object of regular criticisms by human rights groups. France’s participation in the operation that led to the fall of Gaddafi in Libya in 2011 has been followed by limited involvement in supporting democratic governance and defending human rights. Paris is focusing rather on defending its commercial interests while trying to avoid any further spill-over from the Libyan violence. As the director of Human Rights Watch in France, Jean-Marie Fardeau, put it, Paris now favours a confident ‘business first’ attitude in the name of ‘economic recovery’, though this does not mean that France is ignoring other geopolitical and strategic calculations. The seizing by ISIL of several towns in western Iraq in June 2014 has raised concerns about the stability of the region. But this will not necessarily have a deep impact on France’s MENA strategy. True, in mid-August, France decided to provide ‘sophisticated’ weapons to Kurdish Peshmergas to help them fight against ISIL and it has recently joined the US-led air campaign against ISIL in Iraq. But these decisions fall under its long- held commitment to promote anti-terrorism policies and to uphold stability in the region. France’s interests in the region will most likely be persevered with, including energy supplies, investments and arms deals. Therefore, France will prioritise its current alliances. Relations with the US and Saudi Arabia will remain strong, while engagement with Algeria is likely to grow, though cautiously considering Morocco’s sensitivities to this. The attempts to limit Iran’s influence in the MENA region will continue, especially since they are part of the price for keeping good relations with Saudi Arabia. In the coming years, France’s regional role is unlikely to contribute to significant improvements on human rights and governance in the MENA region. It would need first to put democracy and human rights at the forefront of its regional strategy, which might entail losing market opportunities. Although Paris does not anticipate the fall of more regimes, it will keep focusing on anti-terrorism strategies to prevent the risks of spill-over of terrorist violence throughout the MENA region and the Sahel. Francois Hollande is sticking to a pragmatic approach towards the MENA driven by security and economic interests. But there is a distinct risk that this will (once again) come at the price of neglecting the fundamental and controversial issues at the roots of regional destabilisation, such as widespread human rights violations and flawed socio-economic governance. *Barah Mikail is senior researcher at FRIDE. This Policy Brief belongs to the project ‘Transitions and Geopolitics in the Arab World: links and implications for international actors’, led by FRIDE and HIVOS. We acknowledge the generous support of the Ministry of Foreign Affairs of Norway. For further information on this project, please contact: Kawa Hassan, Hivos ([email protected] hivos.nl) or Kristina Kausch, FRIDE ([email protected] fride.org).